Joining us on Saturday, June 22, for the 4th Annual Runner’s Alley Capital City Classic 10K Road Race! It was a nice day to race and the results showed it! Check out results and photos from Granite State Racing Services. This race is the sixth race in the Capital Area Race Series. If you are already registered for the full CARSeries, you do not have to register separately for this race. June 22, 2019 @ 8:00 a.m.
City Plaza, North Main Street, Concord, N.H.
As in previous years, 100% of the race proceeds benefit two amazing nonprofit groups working to make Concord a better place to live; the Concord YMCA and Intown Concord. Help us make a difference in our capital city. The cost is FREE to all participants. The race is open to all kids between the ages of 2-8 years old. The race will start at 9:00 a.m., and the starting line will be located at the front steps of the New Hampshire State House. All participants will receive a finisher’s medal and other fun goodies! Is there a Pre-race Packet Pickup? 12:00 PM to 6:00 PM on Friday, June 22. If I can’t make packet pickup, can I pick my packet up on race morning? YES, you can pick your packet up in front of the State House at 6:30 a.m. on Race Day! How will I know if I PR’ed? 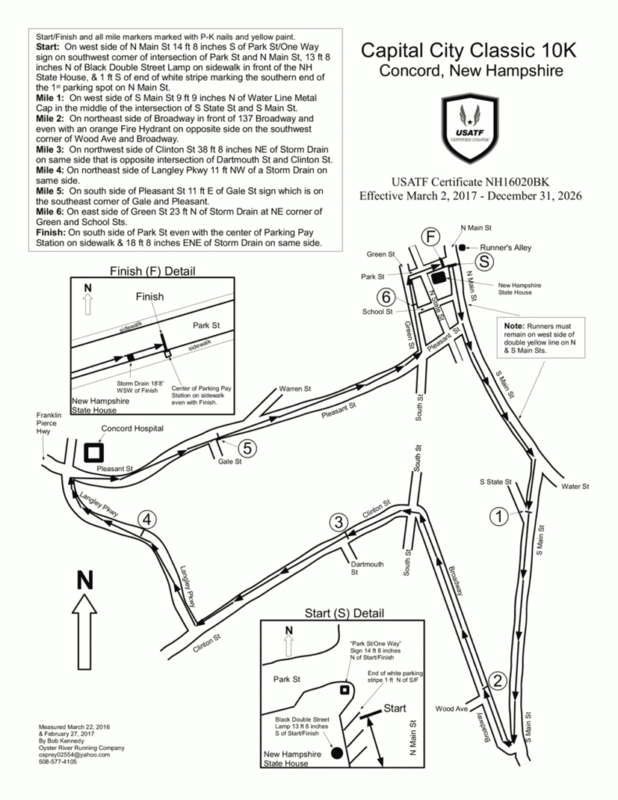 You will be timed by Granite State Race Services using chipped timing attached to your bib. Be sure your bib is not bent and is attached to the front of your body. Where do I park on race day? There are many options to park on race morning. Parking in downtown Concord on Saturday is free. North Main Street will be closed for the race from Centre Street to Pleasant Street. You can find on street parking on surrounding streets and in the three downtown garages. Firehouse Parking Garage: The Firehouse Parking Garage is metered for all-day parking. The garage is located one block west of Main Street. It is situated between School and Warren streets to the north and south, and between North State and Green streets to the east and west. The YMCA is located next door to the structure. You can enter or exit the parking structure from either North State Street or Green Street. Durgin Block Parking Garage: The Durgin Block Garage is metered for all-day parking. The garage is located 1/2 block west of North Main Street between School and Warren Streets. You can enter or exit the parking structure from Warren Street off of North State Street, and Exit on School Street to North Sate Street. Capital Commons Parking Garage: The Capital Commons parking garage is located between South Main and Storrs Streets on the lot known as the Sears block. Entrance and exit is located on Storrs Street. There are 510 parking spaces as well as an elevator and multiple stairwells for easy access to different levels. There will be loads of eco-friendly port-a-potties and hand-washing stations at your disposal when you arrive! Can I run/walk with my dog? We’re sorry; we love dogs too, but cannot allow dogs (even on leashes) to participate. Can I run/walk with my baby jogger? Yes, you can. We ask all those with joggers to please start in the back of the pack and be mindful of all those around you at all times. Where does the course go? Check out the Certified course below! I’m kind of fast, will there be prize money? Yes, there will be prize money for the top 3 male and female runners ($150, $100, $75) combined with other great gifts, as well as prizes for the top 3 in every age group. My whole family is coming can they watch? SURE! We recommend watching from the beautiful new sidewalks of North and South Main Street. After the race, enjoy Market Days with the whole family! Will there be post-race food? Absolutely, please stick around with family and friends, and enjoy downtown Concord and Market Days.